From the Bay to the Blue Ridge! This issue of the Old Town Crier marks the 30th time we have printed a January issue. Looking back 30 years ago, not only does it seem surreal, but it also seems like it was just yesterday. We put our first issue together in December of 1987 in David Underwood’s dining room. Dave was my friend and business partner for 20 of these 30 years. He passed away in January of 2007. He has been missed! In the fall of 1994, my now partner, Lani Gering, joined us. She took a buyout after 20 years with the USDA and was headed back out west when she decided that she wanted to stick around the east coast. Her common sense – Dave and I lacked it at some points over the years – and organizational skills have been instrumental in getting us to where we are today. In all honesty, if it weren’t for her I doubt we would still be in business. She gets credit for the stitching and trimming (staples and rough edges cut off) and the glossy cover wrap. We are trying to see what new wrinkle we can bring to the publication in 2018. We conjured up the concept of the OTC over several “adult” beverages at then Bullfeathers – now O’Connell’s. Neither of us had/has any background in journalism or publishing – Dave was a graphic artist and I sold insurance. We lucked out and found a guy that I played rugby with who was a technical writer for Pepco so we had someone who could do layout, someone who could sell advertising and someone who had some writing skills. Unfortunately our writer friend had some issues that resulted in his leaving us. Keep in mind, it never occurred to us to even think about putting together a business plan; then you tack on the fact that we had no investment money, we basically started in the hole. With a clever advertising sales pitch we gathered a nice nest of inaugural advertisers who promised to pay the minute the paper hit the streets. Well, they did and we paid our printing bill and started on to the next issue. In fact, many of the advertisers you see in this issue have been with us faithfully each month for a good portion of these 30 years. Thanks to our advertisers we have managed to not only survive but to grow in the process. We could have been one of those stories about how the business operated out of a garage, but it was a cold December…so this business started out in the “dining room” of Dave’s townhouse. We had no computer, in fact, back then we didn’t quite understand what a computer was, so we hired someone to type set and print out galleys for us and we pasted them down on boards. We took the boards to the printer the next morning, paid for the printing with a credit card, and picked up the finished product three days later. Our first cover was of the Schooner Alexandria, which was owned by the Alexandria Seaport Foundation and upon which I proudly crewed. The Alexandria was built as a Baltic Trader back in the 1920’s and served as Alexandria’s seagoing ambassador until her sinking off of the North Carolina coast in a storm. Luckily, in the spring of 2019 the revived Seaport Foundation and locals will be bringing the tall ship Providence to Alexandria as our seagoing ambassador. She will grace a future cover for sure. In addition to publishing the OTC every month since January of 1988, we have sponsored some really fun events over the course of those years. In the early nineties the patrons of Portner’s Restaurant (now Columbia Firehouse) would engage in a sailboat race from Annapolis to St. Michaels, Maryland. 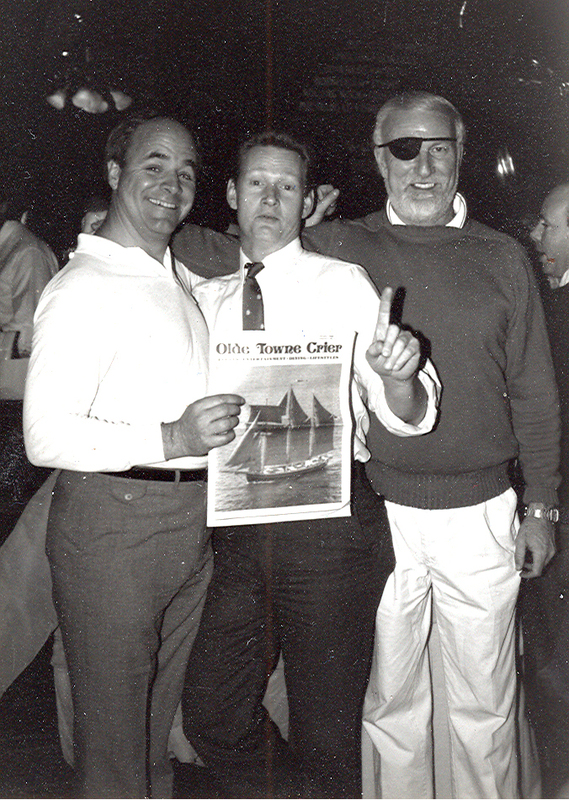 Doug Harvey, the then manager of Portner’s and avid sailor, asked if we would take over the race. We agreed but changed the race from the Old Town Cup to the Old Town Crier Cup. Our first race was in 6 identical 33-foot Hunters and raced from Annapolis to St. Michaels in October of 1996. A year later we moved the venue to Solomons Maryland and everybody brought their own boats for a buoy race in the Chesapeake Bay. We also had as many as two committee boats to take friends out to watch the race. It was a much-anticipated event each year and lasted until 2006. During these earlier days we also hosted a tent at the annual International Gold Cup at Great Meadows in The Plains. This lasted for about 15 years and was another great annual event for our advertisers, guests and friends. Local restaurants stepped up to the plate and catered the event for us, and Kathy Coomb’s original recipe for our signature cocktails – the Golden Stirrup and Silver Stirrup – were a favorite each year. The three days it took for the research at the bar in Landini’s Restaurant was a lot of fun. A lot has changed since 1988, and we have changed with the years. Starting out as a publication exclusively for Old Town Alexandria, we soon began to include the other small towns and old towns that lie beyond the 22314 zip code. Although our primary focus is still Alexandria and the metro area, we extended our content and distribution to other destinations beginning in 1994. Our footprint includes places like Winchester, Middleburg, The Plains, Front Royal, Woodstock, Sperryville, Warrenton, and Culpeper in Virginia and Annapolis, Leonardtown and Solomons in Maryland. We even ship the issue to the St. John in the USVI. We probably should change our moniker to “From the Bay to the Blue Ridge & Beyond”. There are too many people to thank in this space who helped make our publication successful, so I won’t even try. Suffice it to say that, from day one, if it were not for those kind souls who put their sweat into the writing, picture-taking, production help and just a kind word, we would not be here today. To the business owners who, over the past 30 years, realize that the Old Town Crier is, and always will be, a great way to market their wares…we owe them and recognize our responsibility to them! You are welcome at my fire anytime!!! And finally, for all of you who take the time to pick us up and read us…well, if it weren’t for you, there would be no point. We know some folks who read our first issue and all the ones following – that is a total of 360 publications. I cannot tell you how gratifying that is. To all of you, our friends…Many, Many Thanks! What was it like 30 years ago? The number one song debuting in 1988 was Faith, by George Michael. The overall number one song in 1988 was Need You Tonight, by INXS. The number one country song was Addicted, by Dan Seals. People in 1988 wore funky clothes; after all, it was the era of heavy metal. Some of the more popular styles were acid washed jeans, tight mini skirts (think Kelly Bundy, in Married With Children), linen jackets (think Miami Vice), and lots of pastel colors, leggings/tights/colored pantyhose, and high-top sneakers for the guys (rebirth of Chuck Taylor), and ankle boots for the girls. Accessories included lots of multi-pierced ears (still popular among the youngsters), and left piercing for the guys. Hairstyles for the girls were big hair with lots of hairspray and the side ponytail. The top 5 movies in 1988 were; Diehard, A Fish Called Wanda, Bull Durham, Rain Man and Dead Ringers. Rain Man went on the win the Oscar for best picture. The most popular car was the Acrua Legend Coupe and the Integra. The late, great Roy Orbison dies of a heart attack. The last Dodge Aries and Plymouth Reliant roll off the assembly line in a Chrysler Factory. Pan Am flight 103 is blown up over Lockerbie, Scotland; killing a total of 270 people…a new world was anointed with the beginning of modern terrorism.